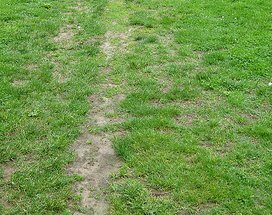 The soil under the areas of your lawn that receive a lot of foot traffic usually becomes compacted. The traffic may be from foot, paw, or tire, but result will be the same. Soil particles become packed closer together resulting in a root zone where there is little air, poor water penetration, and a tough place for roots to grow in. Roots respond to compacted soil with less growth and development. The result is a thin and shallow root system. Lawn growing in compacted soil is typically thin, exhibits stress symptoms easily, and has poor regrowth and recovery from wear. The soil in your gardens and plant beds can be tilled to break up the compaction, but lawns can’t be treated in the same way. The most effective way to help relieve compacted soil in your lawn is core aerating. A core aerator pulls soil cores from the turf helping to soften the soil and allow roots, air and water to penetrate deeper. These holes are generally 2 to 3 inches deep and about ½ inch in diameter. Lawn aeration helps manage the impact of soil compaction.